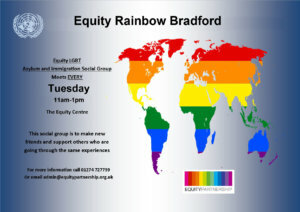 If you’d like to visit the Equity Centre then please contact us beforehand on 01274 727759/79, as it is currently not open on a drop-in basis. If you’d like to call in to visit Equity Partnership please ring us on 01274 727759/79, as the team of staff work part-time. A warm welcome awaits you!